Tucked into a nondescript Chicago neighborhood is a sprawling series of converted factory buildings that are packed full with a myriad of slices of life — everything from a fire station, police precinct, hospital plus a mix of bars, stores, offices and apartments, all connected by a maze-like string of passageways. The exterior of Cinespace Chicago. In this four-part exclusive series, “Inside the ‘Chicago’ Universe,” NewscastStudio takes an in-depth look at the production design behind each of the “Chicago” shows. To bring a behind the scenes look at the production design for each show, NewscastStudio visited Cinespace Chicago in January. 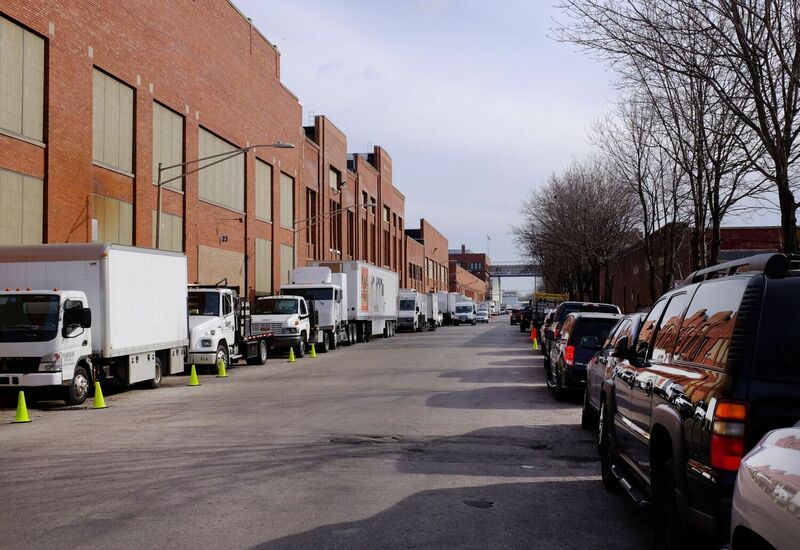 The day of the visit was a cold Monday, and only “Chicago Med” was actively using the stages, which meant the “PD” and “Fire” sets sat mostly empty. After climbing through the piles of snow, heading inside one of the former Ryerson Steel Company buildings is almost like taking a trip through Oz and then back to Kansas (or, in this case, Illinois). An open area with a soaring ceiling too wide to be a hallway is separated by thick, worn industrial metal columns flanked with huge walls pocketed with large garage-style doors and labeled double doors. It’s still cool here, though not quite as cold as being outdoors. On a shoot day, these areas outside of P.D. and Fire’s stages would be bustling with crew members plus all the actors and extras on that day’s call sheet — but today only an occasional crew member walks by carrying a chair or equipment readying for the next shooting day on stage while on-location shoots are completed elsewhere. Heading through one of the double doors opens into yet another unexpected space. It’s warmer here and one gets the feeling of entering a maze surrounded by walls and tall curtains printed with familiar Chicago skyline scenes. The walls of the maze, meanwhile, appear unfinished from outside the maze but, behind real tree limbs bolted together and clamped to stands, a realistic environment with fully finished walls is visible. Entering this dizzying maze through any one of the numerous doors that may or may not lead anywhere in the “Chicago” universe is suddenly like being back in the real world. Whether it be an office, squad room, operating room or bunk room, the spaces here are highly detailed and appear to be lived in and worked in. Every surface, from the walls, floor and ceilings, look real, even though touching them shows many of them to be, in reality, finely handcrafted façades. Even the cold weather outside has found its way inside — with faux frost and snow on the windows — even though, if they were real, they would be puddles of water on the floor. Still, the illusion of being inside a little world is broken from time to time. Perhaps it’s a piece of equipment in one corner, a ceiling tile removed to allow a light to peek through or crew members taking a break in what should be an elevator but in reality just leads to unfinished space. It might also be a crew member walking by a window with a ladder or equipment — which is a bit puzzling since the space is supposed to be on the upper floor of a building. Those same windows sometimes break the illusion when, suddenly, the city view has been pushed aside, replaced with a view of cinder block wall, equipment or even more parts of the maze. Walking through the twisting passageways of the inside of Med’s hospital, Fire’s station or P.D.’s precinct, picking a door at random is very much a game of chance — it might continue the illusion and lead to another treatment room, turnout area or interrogation room, or it may simply be an exit out of the maze, lead to an unfinished wall, or not open at all. Once out of the maze of one set, such as the fire station complex, emergency department or squad room, there are clusters of more sets in a variety of phases of set up, all of which are accessed by more twisting walkways. 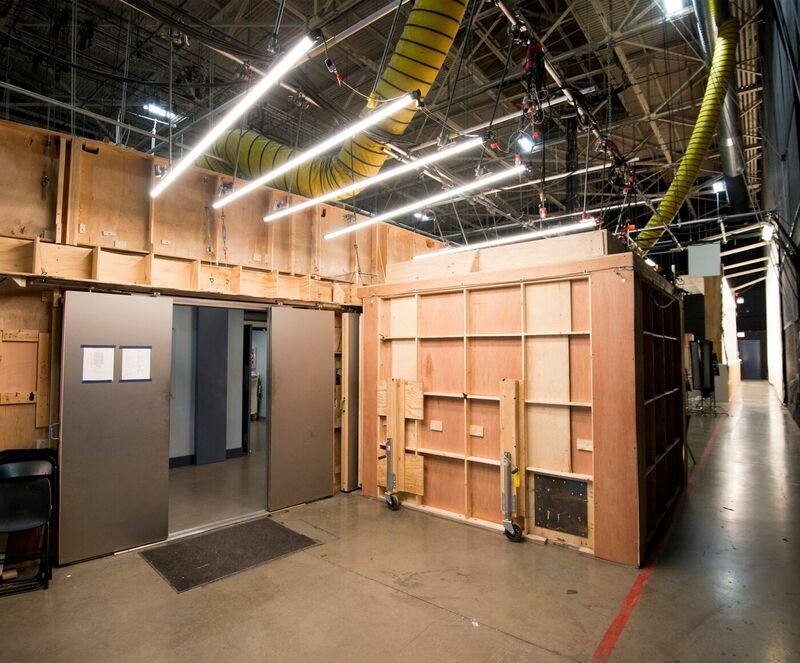 Tucked into other parts of the sets are “deep background” areas — typically just a wall or two finished to match the look and feel of the rest of the firehouse, police station or hospital and strategically placed at the end of a hallway or behind a door to continue the illusion of an immersive space. Typically scenes aren’t shot here, and the show often never fully explains what exactly is in those areas. Visitors to the maze might find anything from a lighting control area, makeshift break spot or storage, often situated just inches out of camera range. The faux exterior of the “Chicago P.D.” precinct set is designed to mirror a real Chicago police building. While winding through the worlds of Fire, P.D. and Med, distinct design motifs of each show begin to emerge, especially on the main sets. The fire station, for example, has the feel of a building built sometime in the last decade with large, more contemporary windows and commercial doors with tiled walls and floors — all of which were inspired by a real Chicago fire house. P.D.’s precinct, on the other hand, gives off a more classic and weathered vibe, with arched transoms over the windows, wood-panel walls and stairways and weathered surfaces that give a sense of a well worn space. Med, meanwhile, skews more modern and is packed with real, state-of-the-art medical equipment to reflect the plot point that part of the hospital was newly constructed at the time the series kicked off. 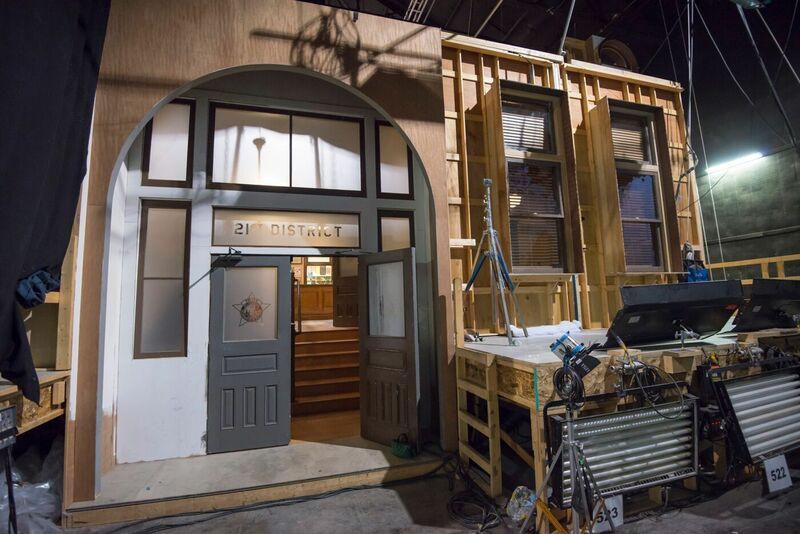 For sets outside the “home base” of each show, such as apartments and bars, the designers tend to allow Chicago’s architecture to shine through, whether it be the industrial loft-style units, narrow layouts or pockets of outdoor areas tucked in here and there. All of the sets can also change on a whim to keep up with production needs. In fact, inside the maze of sets at Cinespace are constant indications that this labyrinth is actually dynamic and ever changing. Segments of flooring from old sets often make an appearance here and there. 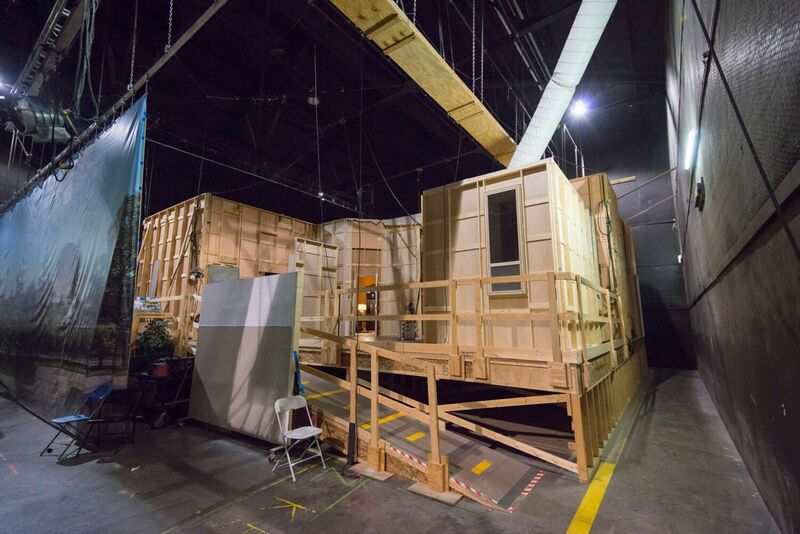 In other spaces, which look like functioning sets otherwise, the unfinished back of a temporary set juts into the space. That’s the thing here — the “Chicago” universe is only limited by what comes out of the writer’s room. Need a physical therapy room for a plot arc? No problem; recycle an old treatment room set. This week’s script calling for a space viewers haven’t seen yet? That’s easy; there’s that door and window that have been mysteriously covered by blinds all these years. Put it there. 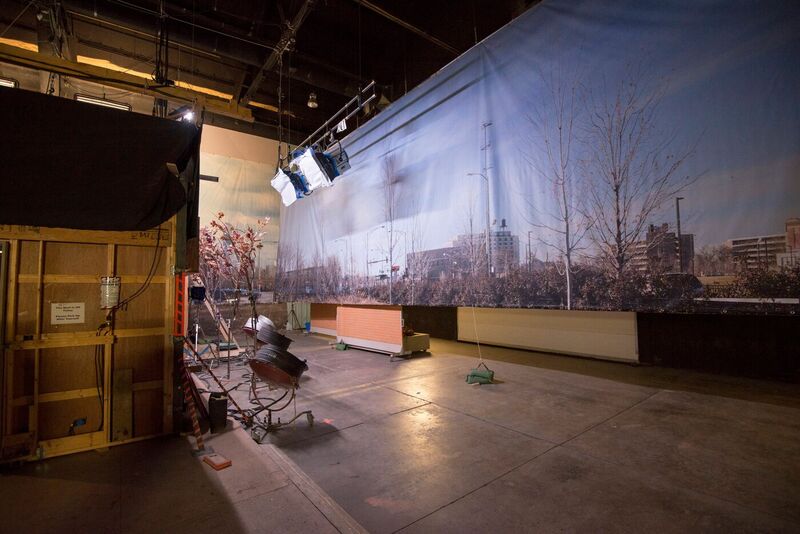 The cityscape backdrop that peeks through some of the windows on the “Chicago Fire” set is dramatically backlit for daytime scenes. Sets are modified or even designed, built and decorated from scratch as needed — often in as little as just over a week’s notice. There are typically eight days of prep time before each episode is shot, which takes up another eight days. 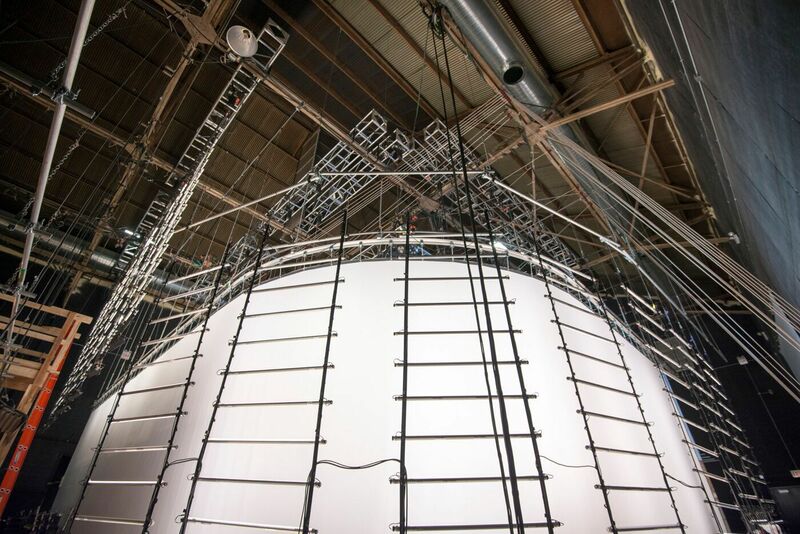 If a particularly elaborate set or change is needed, the schedule is often arranged so that the most time-consuming spaces are shot on the last few days — stretching the production design team’s prep time to about 16 days. Changes to existing sets to accommodate the latest script or director’s vision happen all the time too, often going to such detail as cutting out a camera port inside a character’s locker to get just the right shot. Back on the Med stage, a rehearsal is getting ready to start in the waiting area outside of the emergency department, so it’s more crowded here. Cast and crew are waiting to get to work — often grabbing a seat wherever possible, whether on a wheelchair, gurney, hospital bed or folding chairs in a space behind a door that, on the show, leads to a yet unnamed part of the hospital. Outside the Med stage the maze disappears and it feels more like stepping back into a former steel factory. The chilly wide open space between stages is, since this is a live set, much busier than over at Fire and P.D. Cast trailers have been hauled in and craft services is dishing out its famous egg salad among a smorgasbord of food and drinks. True reality — away from the comfort of fake snow and ice — quickly sinks in just as you step through the doors to the outside of the old factory. Left behind are the finely crafted and meticulously designed fire station, police precinct and modern high tech hospital, all replaced by the realities of another Chicago winter.